Sugar drinks are bad for you. Indeed, too much sugar in any kind of food is a recipe for weight gain, diabetes, chronic obesity and heart problems. And, high sugar levels can also ruin your teeth. Let’s focus on the effects of sugar drinks on your health. Recently, the journal of the American Heart Association, Circulation, reported that people who drink sugar-sweetened beverages have an increased risk for heart disease and cancer. Higher consumption of sugar leads to increased incidence of weight gain and diabetes. And, obesity and diabetes directly affect heart function. In addition, even low-calorie drinks which contain less sugar, also carry an increased risk. While soda drinks are the most publicized culprit for excessive sugar, it’s not the only one. In fact, Americans are drinking fewer sugar drinks now, compared to the last 10 years. So from where is all this sugar coming from? A 12-ounce can of Coca-Cola Classic has 39 grams of sugar. That’s a lot of sugar. But consider, the Gatorade you drink after a workout has just a tad less sugar- still at a whopping 34 grams. Let’s take another example: Do you need an afternoon pick me up so you don’t fall asleep at the afternoon office meeting? Are you reaching out for that 20-ounce bottle of Pepsi which has a ton of sugar (69 grams). So instead, you figure you can save on the sugar by drinking a Grande Mocha Frappuccino containing skim milk and no whip. This has —are you ready? —59 grams of sugar. You will have to do a lot of exercise to burn that off! Fruit ice “smoothies” will give you healthy fruit with loads of sugar, approximately 55 grams in a 15.2 ounce bottle. The apples, bananas, blueberries and strawberries won’t cancel out that sugar. The rule of thumb is that any liquid source of sugar, even if it is a naturally occurring form that is in a concentrate, will have the same negative effect on your health. Your blood sugar and insulin levels still spike and fall with all of these options. Sugar Drinks: No Good, So What Should You Drink? Per the American Heart Association, men should consume no more than nine teaspoons or 36 grams of added sugar a day, and women no more than six teaspoons or 25 grams of added sugar per day. 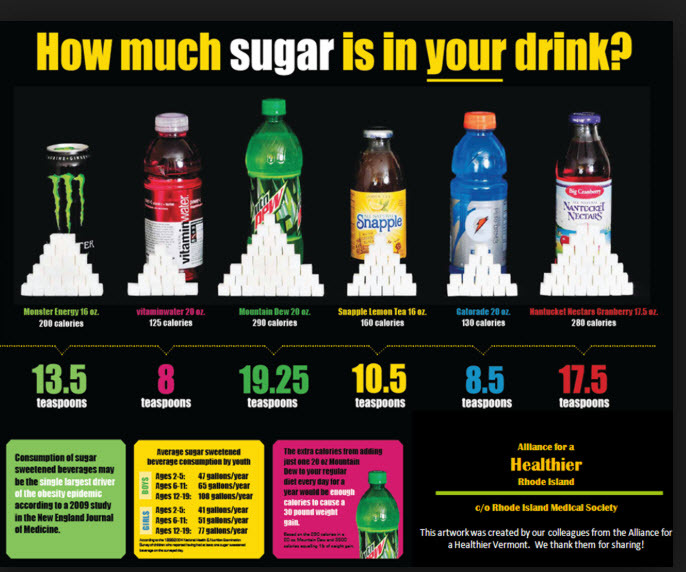 To put this in perspective, one 12-ounce can of regular soda has eight teaspoons of sugar. Cutting back on sugar is difficult. If cravings occur, eat fresh fruit like berries or apples. You can subsitiute your sugar drinks with a diet soda on a temporary basis. The goal is to switch one hundred per cent to water. Be realistic, cutting out sugar is difficult. It can even be considered an addiction. You may have setbacks, but be determined to get over the hump. New regulations from the Food and Drug Administration (FDA) require food manufacturers to list added sugar on food labels, beginning in 2020. This will make identifying surprising sources of sugar easier. The bottom line is stick to drinks with less than four grams of sugar. Or water, which is always a smart choice.